After the credits run, Jackson details the incredible effort and technology that transformed the jerky, black and white footage from film making’s infancy, into a movie that offers an intimate glimpse into the lives of the men who fought, suffered, and died because it seemed their patriotic duty, only to come home to signs reading, “No ex-military need apply” when they went to look for civilian jobs. Out of the many themes they could have chosen, Jackson and his team chose to focus on the everyday lives of the men, and they did so with precise dedication to detail. The voice-overs come from 600 hours of audio recordings, made with the help of 200 veterans in the ’60’s and ’70’s. 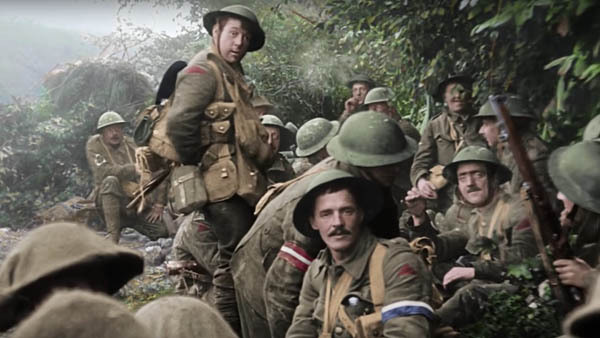 When the footage showed soldiers talking, they used lip readers to determine what was said, then noted the regimental insignias, and then sought readers from those regions of Britain to voice the words. Peter Jackson explains that his fascination with WWI began with tales his father told of his grandfather, who served. Seriously wounded multiple times, he became an invalid and died at age 50. Other members of the film team also lost grandparents in the war. Readers of this blog will know I have a deep and ongoing interest in “the Great War.” It was, perhaps, the greatest loss of innocence that the whole of humanity has ever suffered. We see men who lied about their age to enlist trying to keep that innocence with jokes and horseplay while serving in hell. I strongly recommend this movie to anyone with an interest in this poignant period of history that continues to reverberate through the world we live in today. This entry was posted in History, Movies and tagged history, movies, Peter Jackson, They Shall Not Grow Old. Bookmark the permalink. I would really like to see this! I have known a few WWII vets….unfortunately now passed away. The film was distributed here by “Fathom Events,” which sponsors theatrical showings of special events like this, like operas, and like classic movies (TCM favorites like Rebel Without a Cause). So far two viewings in December and one in January make it the “highest grossing special event of all time.” As a result, this will happen again. I saw a note this evening that on Feb. 1, it will show in 500 theaters in the US and Canada. I’d love to see this film but it hasn’t come out in Spain yet. Wow, I will will look for the Macdonald book. Hopefully the movie will show eventually where you are or become available to stream. So far, the only non-theatrical availability I’ve seen is a DVD available on Amazon. It made me think of my maternal grandfather, Morgan Hopper, who, like so many of the men interviewed in the movie, lied about his age to enlist (here in the US). He trained in the tank corp, and was by all reports, greatly disappointed that the armistice was signed before he made it “over there”…luckily for my mother and me, however! I haven’t seen this. But the title breaks my heart. Just read the complete poem. In the past I’ve mainly read Wilfred Owens’ and Siegfried Sassoons’ war poetry, but this, too, had such power that resonates after the reading. Thanks for the recommendation, Morgan. I will look for it. My whole family are history buffs. My heart is already broken over the loss of humanity in Europe during the 20th century. I have just finished Cristabel Bielenberg’s account of being in Germany with her German husband while he plotted against Hitler during WWII, “The Past is Myself”. The incredible cruelty of both wars between European tribes, death that continues to damage society, gives me a shuddering chill. It’s amazing how they managed to capture and retouch the past like this. Its a one of a kind masterpiece only showing a glimpse of soldiarity, truth and history. They shall not grow old and they shall not be forgotten.